The Real Sgian Dubh Co. - hand made sgian dubhs of distinction. Welcome to the Real Sgian Dubh Co.
Give a gift that will be passed down the generations. 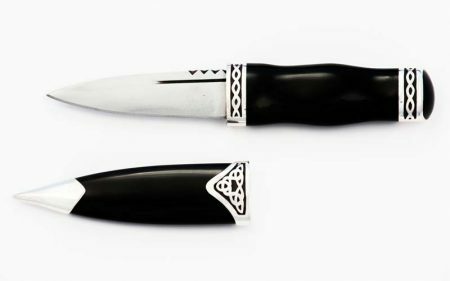 The Real Sgian Dubh Co. hand-crafts beautiful, limited edition sgian dubhs in natural materials of buffalo horn, wood, silver and steel. Natural materials and genuine craftsmanship mean that each sgian dubh is unique; a real alternative to mass produced and soul-less plastic. Don’t wear plastic tat. Have some pride and wear a real sgian dubh! 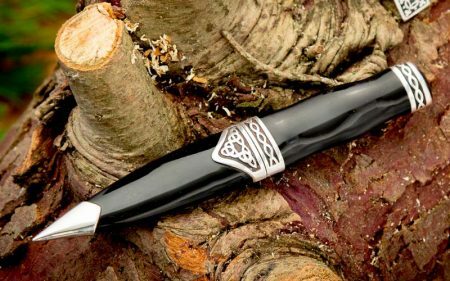 A sgian dubh that’s uncluttered, honest, real and (we think) very beautiful. Made by skilled craftsmen in the Himalayas. We live in a world of identikit mass-production. 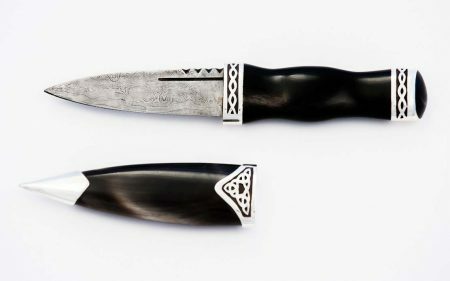 Sadly, the sgian dubh, a traditional Scottish knife and symbol of Scotland’s pride and fighting spirit is now often no more than a lump of moulded plastic with a blade that you can bend with your teeth. We offer an alternative; a handmade sgian dubh that’s made with pride and attention to detail by skilled craftsmen. Our designs are intentionally simple and elegant allowing the beauty of our natural materials and the skills of our craftsmen to shine through. Our traditional sgian dubhs are not just beautiful but are also functional. They come with a choice of stainless steel or Damascus steel blades and all our dubhs are properly sharp. Finally, a no nonsense real Sgian Dubh (as the name of the company states) instead of all these fancy fakes out there. It is absolutely beautiful. You have certainly exceeded your aim in producing the highest quality of work. The sgian dubh is absolutely gorgeous. I am more than happy with it, and I am sure my fiance will be too! If I know of anyone in the market for one of these quality knives, I will definitely send them your way. Great job on the incredible service, and thank you so much! Our horn sgian dubhs are made from the horn of the domesticated Asian buffalo. We search out horns that have slight milky streaks to add interest to our knives and then air-dry them for over a year before using them. Like a fingerprint, no two horns are the same so that each sgian dubh is absolutely unique in its final appearance. Each sgian dubh has four Sterling silver bands. Our craftsmen make each one individually by hand from sheet silver. 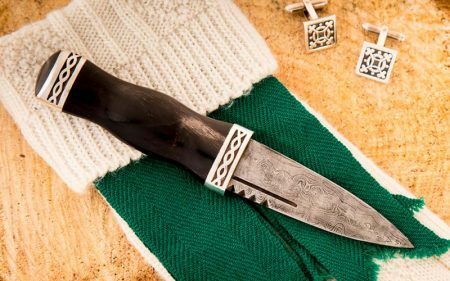 The celtic knotwork patterns are cut with a hand file and then joined to a plain silver backplate, which is blackened to make the knotwork designs stand out. Then, the four bands are then shaped on a tiny anvil before we finally fit them to the sgian dubh. All the silver in our sgian dubhs is Sterling quality, hallmarked in Edinburgh by the Assay Office of Scotland. Our philosophy is simple; we want to make real and genuine sgian dubhs that will bring enjoyment to our customers and their succeeding generations. We pay our craftsmen significantly above the market price for their labour and we pay them in advance or very promptly. £5 from the sale of each sgian dubh goes to support health and development work in Nepal.